My role as both Chief of Military History and manager of the Army Historical Program (AHP) is an exciting one. I am committed to the mission of the U.S. Army Center of Military History (CMH)-informing, educating, and professionally developing soldiers and their leaders for a challenging future in an uncertain world by collecting, preserving, recording, studying, interpreting, and publishing military history for the Army, the nation, and the world-and to the objectives of the AHP and CMH Strategic Plans 2010. In this light, I am accepting proposals for new historical projects that preserve the institutional memory of the Army in concert with Army Vision 2010. Proposals for printed, exhibit, audiovisual, or electronic products may come from within the AHP family or outside of it for any historical project that seeks CMH resourcing help or co-imprinting. The Historical Projects Development Process in this guide will shepherd each proposal from initial idea through formal approval. I invite you to use the Historical Projects Development Process and the Historical Project Proposal Form to submit your ideas for evaluation. I look forward to reviewing each of them. The establishment of the Historical Projects Development Process (HPDP) was mandated by the revised AR 870-5 dated 29 January 1999. The Center of Military History (CMH) promulgated the process with an effective date of 1 January 2000 with the approval of Annex P of the CMH Administrative Standard Operating Procedures (SOP). The HPDP provides a recognized and systematic means for moving proposals for new historical projects from the idea stage to formal acceptance into the Army Historical Program (AHP). Historical projects preserve the institutional memory of the Army as outlined in the AHP and the CMH Strategic Plans 2010. Involves more than one CMH division and/or external agency or a field historical program seeking CMH funding for publication/product co-imprinting/co-production. If an idea or assignment does not meet all of these criteria, then it does not need to enter the HPDP. For example, a field history office that seeks to write and produce a command historical product internally without CMH assistance would not have to send project proposals through the HPDP. If it desired CMH to co-imprint a book or command history, however, that office would assign an action officer to prepare an HPDP Proposal Form (CMH Form 2R [Test]) and submit the proposal to CMH for approval through the HPDP process. Once you have an idea for an HPDP project or one is assigned to you, it is necessary to complete a Historical Project Proposal Form (see page 11 for a sample form). The form can be obtained from your Major Command (MACOM) historian's office, or from the U.S. Army Center of Military History, Attn: DAMH-SPX, Fort Lesley J. McNair, DC 20319-5058. Before completing the proposal form please carefully read the instructions, printed on the reverse side and also in this guide. It is important to keep in mind that this form is the vehicle for presenting your project for review and on which its approval or disapproval will be based. After the form has been completed, with enclosures, it must be submitted through your chain of command. The first level of your chain of command within CMH is usually a branch chief, followed by your division chief. The form must be initialed at each level. If the project originates from a historical office other than CMH, it will require approval at the MACOM historian's level. After the proposal form has been approved through your chain of command, it must be submitted to the HPRP Permanent Staff at the Center of Military History (DAMH-SPX). The CMH Permanent Staff, in the office of the CMH Strategic Planner, will ensure that the form is properly completed, assign a control number to the proposal, and forward it for formal review. If further information or clarification is needed, the Permanent Staff will return the form through channels for revision. The Historical Projects Review Panel (HPRP) reviews and evaluates all project proposals submitted through the HPDP. The HPRP is chaired by the Chief Historian and consists of core and expanded components. The core panel, composed of CMH senior managers, meets quarterly to assess proposed projects originating within CMH. The expanded panel, which also includes members from outside CMH, meets in conjunction with the annual meeting of the MACOM Historians' Council to review proposed projects submitted from agencies and offices other than CMH. The HPRP assesses to what degree each proposal benefits the overall Army Historical Program. The panel evaluates the new proposals in relation to each other and to past and present proposals and projects. After completing its review, the panel ranks the proposals in priority order and submits them, with recommendations, to the decision-making committee for final action. 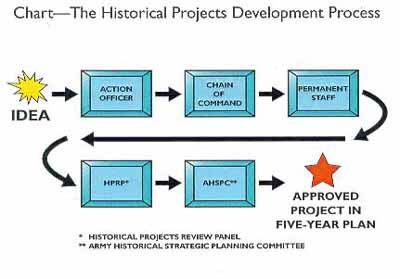 The Army Historical Strategic Planning Committee (AHSPC) is the approving authority for project proposals that are submitted through the HPDP. The AHSPC is chaired by the Chief of Military History and meets annually in conjunction with the meeting of the Department of the Army Historical Advisory Committee (DAHAC), usually held in October. Taking into consideration the HPRP recommendations, the committee reviews all proposals and approves or disapproves them. For approved projects, the committee will estimate starting dates and assign resources, when appropriate, to complete the project. Projects approved by the AHSPC will be included in one of the Army Five-Year Historical Plans. The Army Five-Year Historical Plans are monitored by the Chief of Military History, the AHSPC, and the DAHAC through the annual Army Historical Program Report, prepared by the Chief Historian. The Permanent Staff will notify the action officer of the AHSPC's action on the proposal. For management purposes, approved projects will receive a historical project (HP) number assigned by the Permanent Staff. At this point, the HPDP journey is completed. Approved projects now enter the CMH Historical Projects Management System (HPMS-See Annex Q of the CMH SOP) for printed, exhibit, audiovisual, or electronic products if a CMH project or the appropriate project tracking system if a non-CMH project. The proposal is the only vehicle by which evaluators may determine the substance of each project, the contribution it may make to historical scholarship, and its general quality. Critical elements for evaluation are a sound intellectual justification for the project; a clear and coherent evaluation of its significance; an appropriate plan of work; and a cost estimate. The project title should be descriptive and substantive. Narrative portions may be continued on separate pages, numbered and clearly labeled with your name and project title. Enclosures with supplementary materials may be attached. A project proposal may be submitted at any time. However, for prompt decision making by the AHSPC, the package must reach the HPRP Permanent Staff at the U.S. Army Center of Military History (DAMH-SPX) no later than 15 July. Notification of the AHSPC's action will be sent out following its annual meeting in October. Item a. Enter name and mailing address. Item b. Enter daytime telephone numbers (include area code). Item c. Enter job title (if federal, include series and grade). Item b. Enter name of authorizing official. Item c. Enter daytime telephone numbers (include area code). Enter a descriptive title that clearly identifies the project and its contents. Check the form chosen for the final product and explain the rationale for the choice. Define the primary audience for whom the product is intended, stating clearly why the proposed project is important and what relevance it will have to larger issues or themes in the Army's history. Provide a narrative description of the proposed project, covering its ideas, objectives, and methods. Provide a detailed description of the proposed organization and implementation of the project. It is advisable to provide a plan of work by three-month periods-delineating the stages by which the proposed project will be carried out, describing what will be accomplished during each stage and the tasks to be undertaken, and estimating milestones. Prepare a detailed cost estimate of all needed resources by fiscal year of expenditure, including both direct and indirect charges to the project for such items as salaries and wages, supplies and materials, travel, and services (duplication, postage, long-distance telephone, third-party contracts). Provide any other useful information that will be helpful to evaluators in determining the project's larger significance.